Coach's Corner - Jimmie Foxx hand signed vintage Boston full size pennant! Go Back to Lot List Jimmie Foxx hand signed vintage Boston full size pennant! 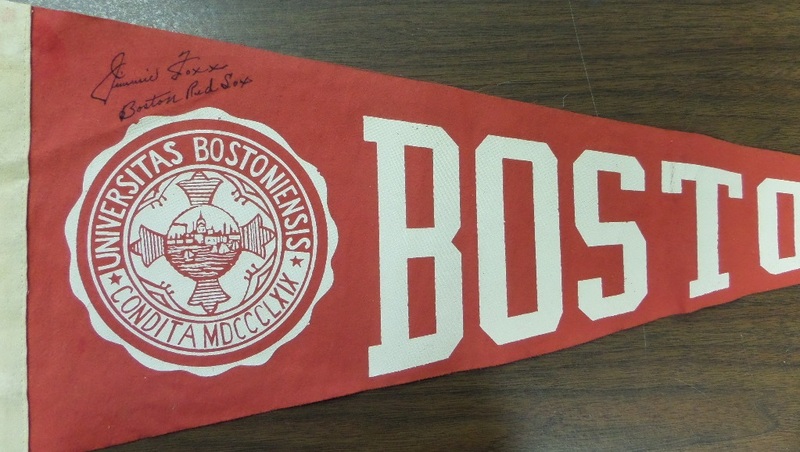 This super cool collector's item is a full size "Boston" red pennant, probably from the 1930's or '40's, and in VG+/EX overall condition. It is penned in black by Red Sox 1938 AL MVP and HOF 1st sacker, Jimmie Foxx, the signature grading a very strong overall 8.5, and including a Boston Red Sox inscription. With his death now well over a half century ago, retail on this RARE collectible is easily low thousands!